Study conducted by the Centro de Memória das Lutas e Movimentos Sociais da Amazônia. Document published in “Leyes, políticas y economía verde al servicio del despojo de los pueblos” (Laws, policies and green economy at the expense of communities dispossession) special compendium of the “Biodiversidad sustento y culturas” (Biodiversity livelihoods and cultures) magazine carried out jointly by Alianza Biodiversidad, World Rainforest Movement (WRM) and Friends of the Earth Latin America and the Caribbean (ATALC) in December 2013. 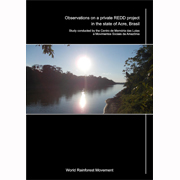 In 2007, the state of Acre, located in the southwest of the Brazilian Amazon region, established the guidelines of its Policy for the Valuation of Environmental Ahttp://wrm.org.uy/wp-content/uploads/2013/11/Consideracoes_sobre_um_projeto_privado_de_REDD_no_Acre.pdfssets, aimed at “providing incentives for sustainable production chains” and guaranteeing the preservation of the rainforest and its resources. Three years later, State Law No. 2.308 of 2010 created the Environmental Services Incentives System (SISA). The ISA Carbon Programme (programme of incentives for forest carbon-related environmental services) created by the government of Acre is considered the most advanced jurisdiction-wide REDD mechanism in the world. This article looks at the first private REDD project to be implemented in the state of Acre. In its Project Design Document, the Purus Project is presented as a REDD initiative aimed at mitigating deforestation pressures on 34,702 hectares of forested land in the municipality of Manoel Urbano, located roughly 200 km from the city of Rio Branco, the capital of Acre. According to the Project Design Document, the “overarching objective” of the Purus Project is to “generate sustainable economic opportunities for the local communities” and to “implement social projects”, while mitigating deforestation and preserving biodiversity in the project area. This so-called “pressure” on the forest – resulting from subsistence agriculture and small-scale livestock grazing, viewed by the project proponents as unsustainable practices – is the reason for which the 18 families living in the project area (roughly 100 people) are classified as “deforestation agents”. It should be stressed that the construction of this narrative of culpability is essential to grant legitimacy to a conservation project whose creation could only be justified by the existence of an actual threat to the forest. Despite the apparent willingness to “allow” the current occupants to continue living in the area, the restrictions that they attempted to impose on the traditional practices of the community gave rise to a confrontation that has yet to be resolved between the occupants of the land and the company owners.